The Razer BlackWidow X Chroma makes a charming appeal to gamers that are looking for a sleek, good quality mechanical keyboard that features some of the highest quality customisable RGB lighting on the market. The footprint is relatively small compared to many other gaming keyboards as it does away with additional macro keys and so will free up space on desks that are rather constrained. The exposed switch mounting means that it is easier to maintain and clean, though there is a little trade off with outright brightness of the LED lighting. There are a few downsides we can note with the BlackWidow X Chroma, firstly, even though it is cheaper than the standard BlackWidow Chroma, does away with some conveniences that seem disproportional to the price point regardless. Such as the lack of USB/audio pass-through. Then, we discovered that the whole keyboard bends in the centre while in use too, something that simply feels like it should not happen. Then we can get to some small niggles such as the use of metal bar stabilisers in the larger keys rather than the use of dummy switches, something that simply feels better and more convenient to fix should there be any issues. 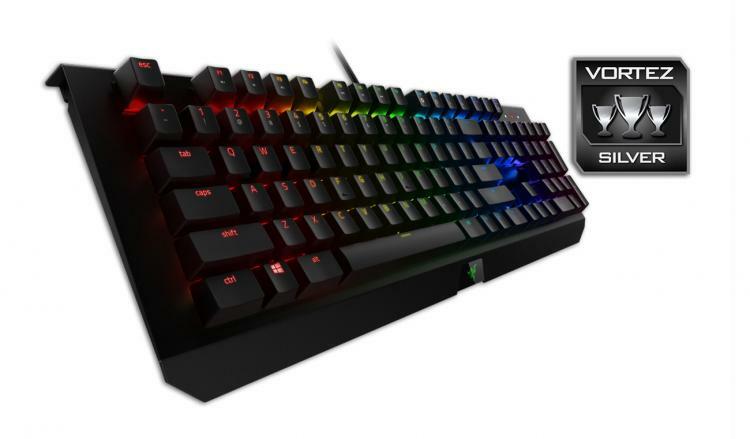 Considering that the BWXC is priced similarly to the Corsair K70 RGB, you certainly get the impression that Razer are not offering similar value for money, especially after all the considerations made and then realise that Razer did not include any bundled accessories. Though comfortable in use, Razer could have included a nice wrist rest purely to give people that choice. Despite these considerations, the BlackWidow X Chroma is a fantastic keyboard with some top quality features. Whether it is the sleek black aesthetic, or the top class RGB lighting, this will be one to consider amongst the best of them. Razer remix the BlackWidow formula into a sleeker, more mature aesthetic, yet still features the exceptional top quality Chroma lighting and per-key programmability.